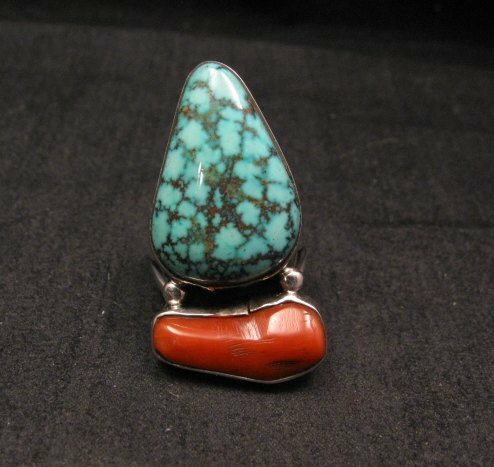 Top quality Native American Pilot Mtn turquoise & coral silver ring, hand made by Navajo artist, Marvin Redhouse, a protege of Orville Tsinnie. Natural stones. 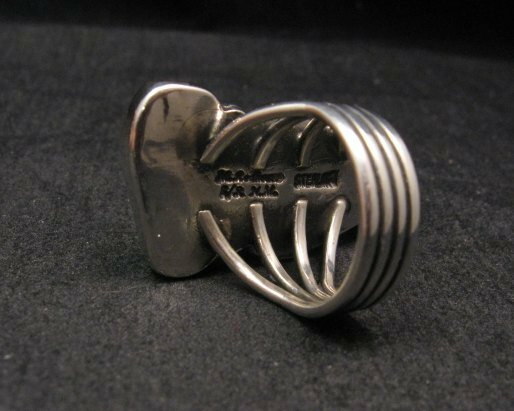 The face of the ring measures 1-1/2 inch long by 3/4 inch wide. Size 7. Item#6375. 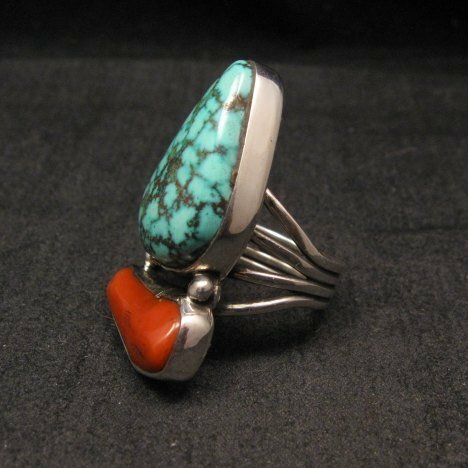 Native American handmade and authentic high grade Pilot Mountain turquoise, coral and sterling silver ring, handmade by Navajo Marvin Redhouse. 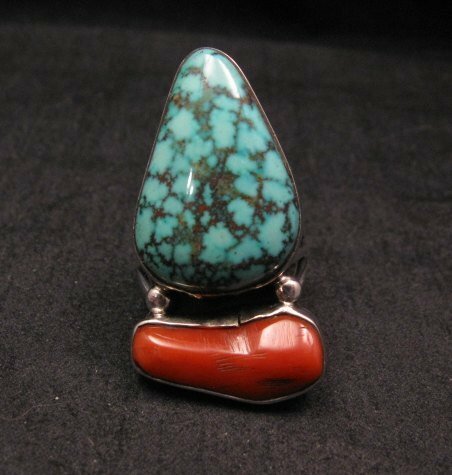 Marvin is a protege and son-in-law of the well-known silversmith Orville Tsinnie and works out of his studio, Orville Tzinnie & Co. He learned silversmithing under Orville's direction and worked with him until Orville passed away in 2017. 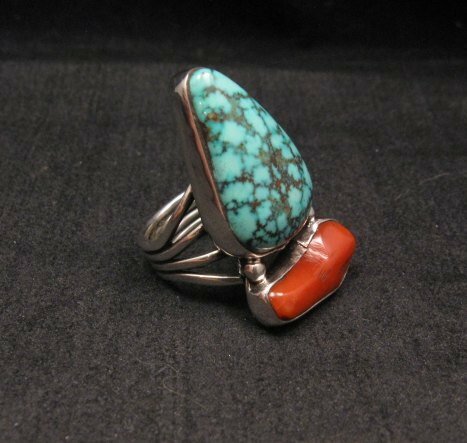 A natural Pilot Mountain turquoise stone and a piece of natural coral are featured in this bold contemporary ring is made from heavy gauge sterling silver. Heavy 4-wire shank. 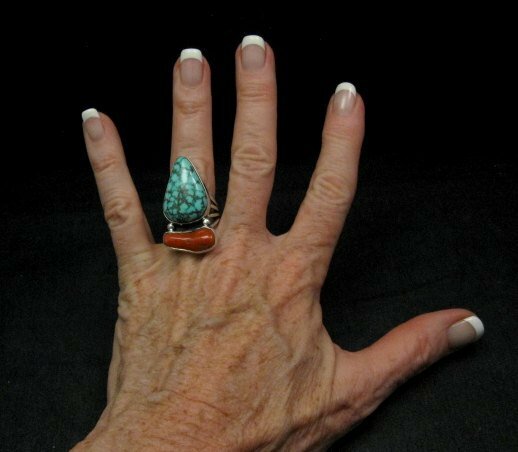 The face of the ring measures 1-1/2 inch long by 3/4 inch wide. Weighs 16 grams. Size 7. Brand new and in perfect condition. Gift Box and Certificate of Authenticity included. Hallmarked by the artist.